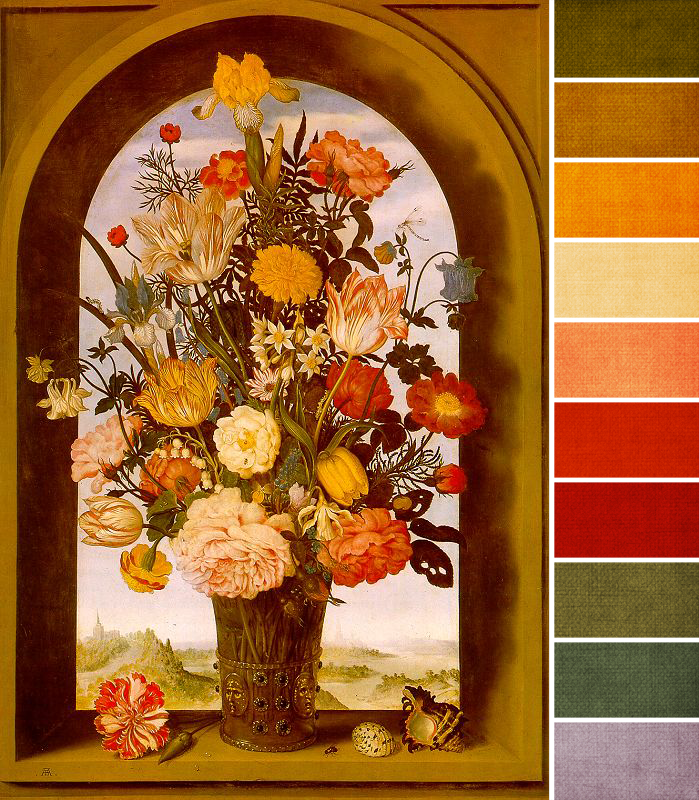 This month, we're using a gorgeous floral painting, Vase with Flowers in a Window, 1620, from Ambrosius Bosschaert the Elder as our inspiration challenge piece. And it's absolutely lovely, and so fitting with the season, don't you think? Color-wise, it's all about gold and warm yellows. That was my first impression, and as I was pulling together this palette, I saw that almost every color has a warm base. So, when picking beads for your challenge pieces, I'd suggest focusing on the warmer tones and shades - mustard yellows, tans, creams, peaches, red-oranges, and yellow-greens in particular. Aside from the creams and tans, I'd probably keep the everything on the slightly darker side; though not muted, the shades aren't super bright, either, particularly the yellows and reds. As for the reds, I'd definitely stick to the red-oranges, if at all possible, versus a bold red. Tiny touches of a warm teal (found in the bouquet) and gray blue (of the sky) can help cool things down, but if you're following the painting faithfully, use only a little of these. Same goes for the darker oranges and reds. If you're finding yourself wanting a dark color, choose the brown on the left side of the arch and in the shadows; Vintaj natural brass would be a perfect metal choice to bring in that color into your piece. Aged gold-tones would also be a great choice for your metal, as the yellows here aren't quite so bright. Alternatives could include some brown leather and patina'd metals, particularly the warm yellow-green (third swatch from the bottom on the palette). What an exciting painting! What colors are you planning on using?